7 Kids and Us: Minnie's Winter Bow Show NOW on DVD + Giveaway!! Join Minnie, Millie, and Melody on a wild winter wonderland adventure to the Clubhouse North Pole after the glove balloon that they have all stepped into accidentally takes off! But thanks to a Go-Bow-Buggy provided by Snow Fairy Clarabelle, they are able to get back in time to finish the preparations for the grandly successful Winter Bow Show! This magical value packed DVD includes Minnie’s Bow Show, three additional fun filled episodes, plus ten Minnie’s Bow-Toons AND a FREE pink Minnie hair bow. 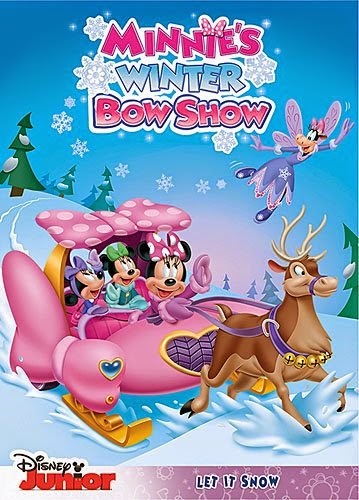 Just in time for the Holidays, with a wave of a wand and some “Mouseke-doodle-lee-doo” magic, join Minnie, her two energetic nieces and her Snow Fairy Clarabelle in this new adventure Minnie’s Winter Bow Show on Disney DVD on Tuesday, November 18. 2 readers are going to WIN copies of their very own! Enter using the rafflecopter form below..and GOOD LUCK!